My POWr form has Require Payment enabled. I received a payment through PayPal, but I didn't get an email alert from POWr. What's going on? First, go through the steps listed in this article to rule out an issue with your form setup or email provider: Where are my form email alerts? If the tips in that article don't solve the issue, open your Form Response Dashboard. If the Payment Received shows No for a customer who did send you a payment, you may have Instant Payment Notifications (IPN) disabled in your PayPal Merchant account. With IPN disabled, you are not allowing POWr.io to know about your payment status. This results in no form emails being sent to you because the email only gets triggered only once a payment has been confirmed. 7. Please do NOT enter a Default Notification URL. Moving forward, you should now see the Payment Received column update accordingly whenever you receive a payment through your POWr form. You will also start receiving emails for submissions that were followed by a successful payment. 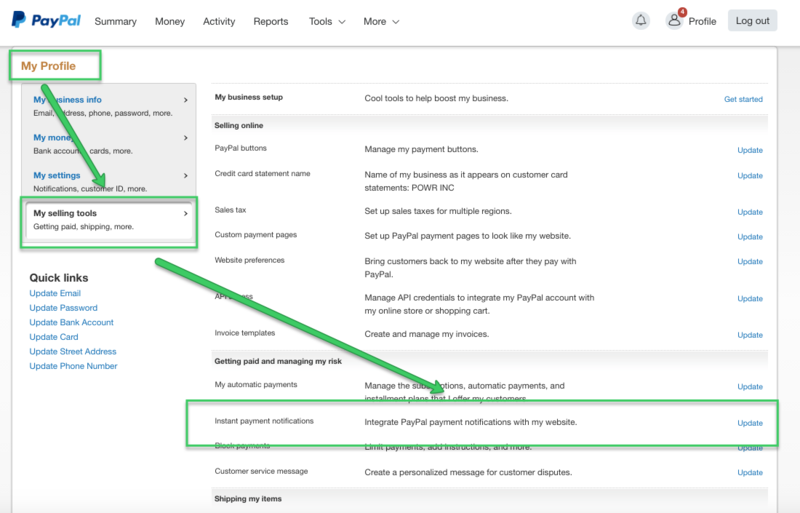 Please note: If you're using eCommerce and your Sales Dashboard does not display any sales transactions, please use the same steps above to enable your PayPal IPN. This will then allow PayPal to send us the successful payment transaction and your future sales transactions will now appear in your Sales Dashboard. I'm confused by step 7. What is the url I must enter in the Notification URL box?